Land Art Generator Initiative 2012 was an ideas competition to design a site-specific public artwork that, in addition to its conceptual beauty, has the ability to harness energy cleanly from nature and convert it into electricity for the utility grid. In partnership with New York City’s Department of Parks & Recreation, the LAGI design competition was held for Freshkills Park (the former Fresh Kills Landfill). 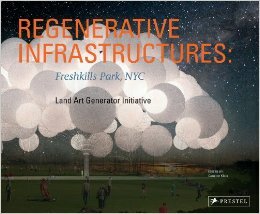 The expansiveness of the design site at Freshkills Park presents the opportunity to power the equivalent of hundreds or even thousands of homes with the artwork. The stunning beauty of the reclaimed landscape and the dramatic backdrop of the Manhattan skyline provide an opportune setting from which to be inspired. Freshkills Park offers the perfect environment to showcase the immense potential of aesthetically interesting renewable energy installations for sustainable urban planning. The results of the to the 2012 LAGI competition were overwhelming, with 250 submissions from around the globe, representing teams of artists, architects, designers, engineers, landscape architects, and more. The entries prove that renewable energy can indeed be beautiful. Many of the design ideas are practical in terms of their constructability and integrate proven technologies as working media within the artwork to generate large amounts of clean energy. Each of these designs would stand as a positive amenity to the public spaces of any city. Thank you to all who participated and made the 2012 competition such an overwhelming success. Regenerative Infrastructures (designed by Paul Schifino) features many of the top submissions to the Land Art Generator Initiative 2012 competition, which aims to create sustainable design solutions that integrate art and technology into renewable energy infrastructure around the world. The book draws a much-needed connection between the two critical issues of sustainable development—energy generation and waste management— highlighting solutions that address both problems at once, thereby creating economically beneficial hybrid utility installations. Download the complete LAGI 2012 design brief. Download the LAGI 2012 launch brochure (designed by Paul Schifino). 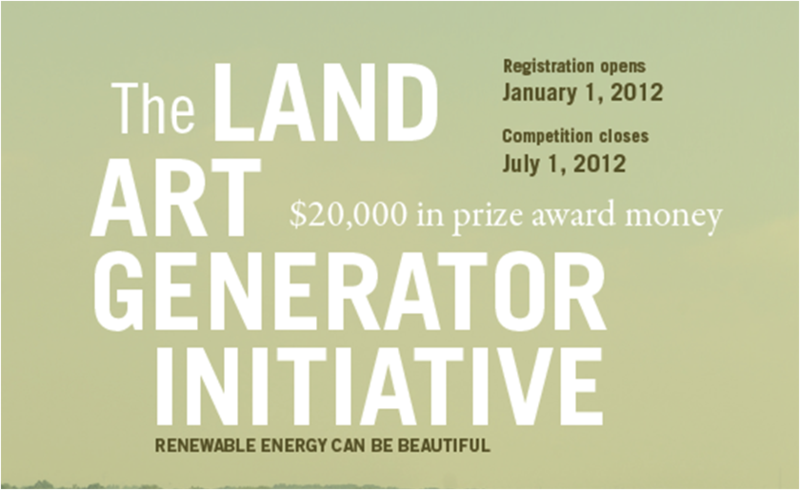 Visit the Land Art Generator Initiative website for more information and for current competition information.